Don’t you just love how in dramas and movies that one way a woman tries to hold on to a man is through a child? This is NOT just something found in Asian dramas and movies. Apparently, some women are stupid enough to believe that having a child secures their place in a family. At times it can, and at other times it can completely backfire. I have always disliked Saewa. Having her come to this decision makes me hate her even more. Why? I feel badly for the poor child who becomes a pawn in a game really. Yeah, so we open Smile, Donghae episode 40 with Saewa in complete shock at finding Kim Joon standing at the top of the stares. And if looks could kill, Saewa would be dead. Instead of letting her explain, the angry Joon just turns and leaves and Saewa rushes after him. Is there any way for her to fix this? Meanwhile, Hye Sook and Do Jin are waiting for Saewa and Joon in Hye Sook’s office. Why aren’t the two coming? Do Jin tries calling both his father and Saewa, but neither pick up. Saewa follows Joon all the way into his study declaring that what he saw wasn’t the truth. Um…this sounds an awful like are you going to believe what you saw, or what I tell you? Of course, Joon doesn’t buy this for a minute. I guess he believes that Saewa and Donghae are still seeing one another—which they aren’t. Okay. So I get why he’s mad. It makes perfect sense. Saewa insists that she and Donghae are over and were over before she became involved with Do Jin (blatant lie, blatant lie). Saewa also says that she loves her husband and would never do anything to betray him as she cannot live without him (correction—she can’t live without his status, wealth, and power). Saewa also says that Donghae only came to Korea for revenge since she broke up with him. That’s why he’s working at the Camilla and insinuating himself into the Kim family. Omo. Again, blatant lie. But of course Saewa can’t tell Joon the real truth. Donghae goes home and you know that in spite of his big words to Saewa in the previous episode, he isn’t happy at all about being her cooking assistant. Bongi then comes out and wonders why he’s so late. Why, was she worried again? Bongi and Donghae need to practice. Donghae goes into his room and Bongi follows him demanding to know what’s wrong because he doesn’t believe his lie that he’s fine. He reveals what happened earlier and Bongi wonders why Saewa has taken a sudden interest in cooking. She also understands Donghae’s decision to not be the one to back down and quit. She also encourages him by saying if he’s truly over Saewa, then it really doesn’t matter if they see one another—which is true. Does anyone else feel a little bad for Donghae? He’s being constantly beat up by Bongi. Okay, that’s extreme. It’s actually really cute how she’ll slap him, kick his shin, or stomp his foot like a bratty little girl. What a great relationship—Donghae constantly calls her ugly and she constantly is hitting him in some way. You can tell they show their affection like children on a playground. Anywho, They then discuss the cooking competition and Bongi asks Donghae to go to the beach since creation makes her think of the ocean. Enter Anna desperately searching for her cellphone. When Donghae and Bongi ask what she’s looking for, Anna is about ready to tell them, when she recalls Pil Jae’s words to keep it a secret. 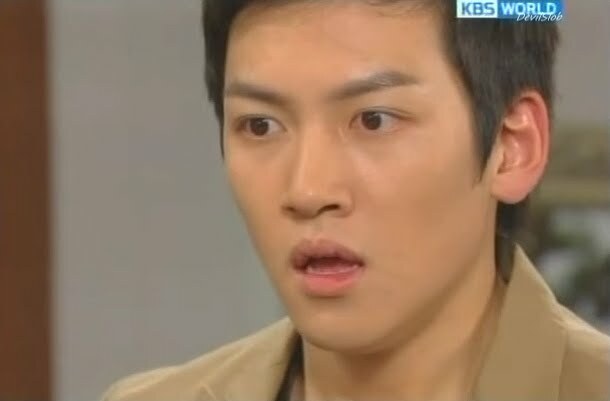 As for Pil Jae, he’s in for the shock of his life. He is horrified to find Sool Nyeo there in place of Anna. How can this be? Thus he’s forced to watch a movie with her (I’m surprised he stuck around to do so) where she’s constantly making a move and getting way too close for his comfort. At the Kim home, Joon is in deep thought in his study while Saewa is in deep worry over the unexpected situation. She goes to talk to him once more just as Do Jin and Hye Sook arrive home. They demand to know what she’s doing there when they were supposed to have dinner together. Plus, why didn’t she answer her phone. Saewa says she felt unwell and forgot to contact them. Enter Joon. This shocks Hye Sook and Do Jin as well. Why is Joon home, too? When Joon asks to talk to…okay, I’m kind of uncertain if it was supposed to be Saewa, Hye Sook, or Do Jin, Saewa faints. I don’t know if this is one of her faking schemes or if the stress really caused her to pass out. After this, Hye Sook asks Joon why he was home and he said he was sorry, but something unexpectedly came up. He is keeping things quiet for now until he can figure out just what is going on. He does, however ask for more information about Donghae. Hye Sook explains that he came to her rescue several times. One one hand it can go against what Saewa said by showing how good Donghae is, but on the other hand, it can also show that he has been inserting himself into the Kim family lives. 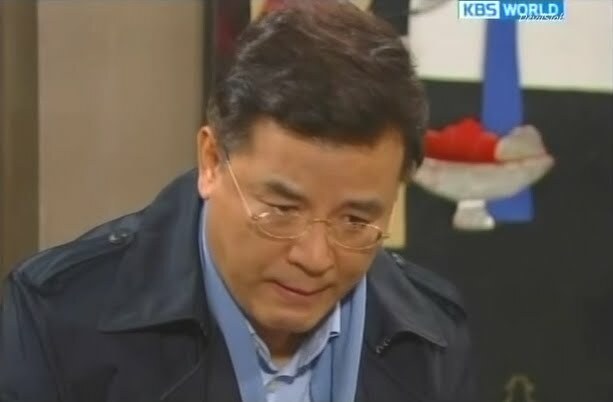 Meanwhile, Do Jin feels badly for not noticing Saewa was unwell and being angry with her over not answering her phone. Saewa and he hold one another and Saewa asks for her wish to be granted. What wish? She wants his child as soon as possible. Gag me. Of course, Do Jin has no problems with starting a family right away. Do Jin leaves and Saewa desperately tries calling Donghae. Donghae is happily out with his mother and Bongi at a fish market. He gets Saewa’s call but purposefully ignores it. Looks like Saewa can’t get Donghae to corroborate her story like this. Since Sool Nyeo is gone, Tae Hoon and Sae Young are at their wits ends with the twins. They keep crying and the two are not getting a moment to study, sleep, or even bathe (even though I’m not a parent, I’ve done enough babysitting to know that you really don’t get a chance to eat, sleep, or bathe at times). Sae Young decides to abandon the twins to her husband’s care so she can get in a shower as she is sick of smelling like baby vomit. Poor Tae Hoon (who had just got peed on by one of the twins) just doesn’t know what to do. How can he handle two crying babies? Meanwhile, the missing grandmother hands Pil Jae her purse while she goes to the bathroom. Pil Jae wonders how she could show up and ruin everything and then he calls Anna’s number. He finds the phone in Sool Nyeo’s purse along with her own. Pil Jae quickly puts her phone back and pockets Anna’s when Sool Nyeo comes out. At this point, he tells her that it’s wrong for the two of them to date as they are in-laws. Sool Nyeo doesn’t care about that as it isn’t illegal, plus they need to live their own lives now. Pil Jae, however insists they should forget this just happened as it’s wrong and he cannot forget that they are “related.” He takes back the flowers and rushes off. LMAO. Great recovery…poor Sool Nyeo doesn’t know what hit her. Pil Jae rushes home and is soon followed by Donghae, Anna, and Bongi. When Donghae and Bongi go to put their fish away (they are using that and fish roe for their creation dish), Pil Jae gives Anna her phone back and tells her to be more careful with it. He also, again, asserts not to let anyone know she has it. Donghae comes out and sees Pil Jae whispering in his mother’s ear and he gets upset. His mom isn’t hard of hearing so Pil Jae doesn’t need to be that close. Such a protective son. Donghae then takes Anna back to their room and he asks her about Pil Jae. Anna thinks Pil Jae is a nice man, but there is only James in her heart. Sool Nyeo arrives home and faces Sae Young’s wrath. However, Sool Nyeo doesn’t care. Those aren’t her children. She will not take care of them for her daughter. Instead, she will only watch them when she feels like it as she will be living her own life from here on out. This astounds Sae Young. Now, at first, I had no idea why Sae Young and the twins are in Sool Nyeo’s room, but then I remembered that Tae Hoon is supposed to be studying to retake his exams once more. Anywho, the twins wake up crying, but Sae Young refuses to move so its up to Grandma to get up and take care of the babies since she can’t ignore their crying like her daughter. Sool Nyeo gets up in frustration and hands one off to Tae Hoon because she can’t put two babies back to sleep simultaneously. Saewa gets up in the middle of the night to track down Donghae so they can get their stories straight. At the same time, the disturbed Joon gets up. Hye Sook then wakes up and notices he’s gone. Joon meets Saewa coming down the stairs and she lies and says that she’s going out to get medicine since she still feels poorly. She tries to talk to Joon again about what happened, but out comes Hye Sook wondering what is going on. Joon says he came out for water and Saewa lies again and says she was going to try to take a walk to see if it made her feel better. Lies, lies, lies. They will eat her alive. The next morning, Saewa is the last one to the breakfast table. Joon is still treating her rather coldly. Do Jin has had porridge made for her and when Joon can’t take the loving scene of his son taking such good care of his wife and goes to leave, Saewa immediately jumps up to try to talk to him. This spills the porridge all over her lap. Good job, Saewa. Really, all of your actions are pointing to just how guilty you are—not how innocent. Oh, we also have Hye Sook request that the maid ask if Sun Ok can cook more dishes since her kimchi is excellent. So you know that secret is going to come out soon. At the Lee house, everyone has gathered for breakfast save Pil Jae. So Anna takes out her cellphone and calls him to tell him to hurry to eat. This shocks everyone. Anna then explains that Pil Jae gave her the phone. As soon as he comes in, Pil Jae gets the third degree. He keeps to his lie that the phone was free and since everyone in the house save Anna had a phone, he gave it to her. LMAO. Well, that did cover his tracks somewhat. The house phone then rings an it’s the Kim house requesting for Sun Ok to take a job cooking for the family. This makes Sun Ok ecstatic (extra income you know). Oh, and you have to love Sun Ok’s warning to Pil Jae, Anna, Donghae, and Bongi. If she sniffs out that any of them are dating, they will be tossed out. LOL. We then cut to the hotel where a guest is eating food. She seems to be quite passionate about food and quite angry when something doesn’t agree to her taste. She goes to the kitchen where she is told that customers are not allowed. The guest replies she isn’t a customer and demands to know who made the salad. Bongi says it was her and the guest immediately complains of the overwhelming oil taste from the broccoli. It’s a fresh salad, so broccoli should be raw. Donghae comes to Bongi’s rescue and tries the salad. Yes, the oil is too much, but he then explains the broccoli was cooked in oil to help balance the meal since the guest didn’t order something. This impresses the guest. Donghae has made a good impression on her. Enter Head Chef. It turns out the girl is none other than the new assistant head chef Baek Yu Jin. She then locks on to Donghae and asks if he has a girlfriend. She then doesn’t wait for his answer as it doesn’t matter to her because she ALWAYS gets what she wants. LOL. Bongi is fuming—she’s got some competition now (okay, not really as well all know Donghae won’t look at another girl than her even though they aren’t officially dating yet). Donghae leaves the worried Bongi to go and deliver Joon’s food. At the station, Joon is recalling what Saewa said about Donghae and Do Jin. He then calls Hye Sook asking if she has free time. He then says he’ll go to the hotel later to talk. Uh-oh. Meanwhile, Saewa is still agitated and still unable to get a hold of Donghae. When two other announcers come up to her and ask after her health, Saewa lies that she is fine (even though she made tons of mistakes during the broadcast). Another announcer asks after Donghae and Saewa rushes out in hopes to catch him before he sees Joon. However, she just misses him and we end with Joon asking Donghae if Saewa is his ex-girlfriend. I wonder what Donghae will say? I don’t think he’ll lie, but I wonder how much of the truth he will tell as you know that unlike Saewa, he won’t throw anyone under a bus.